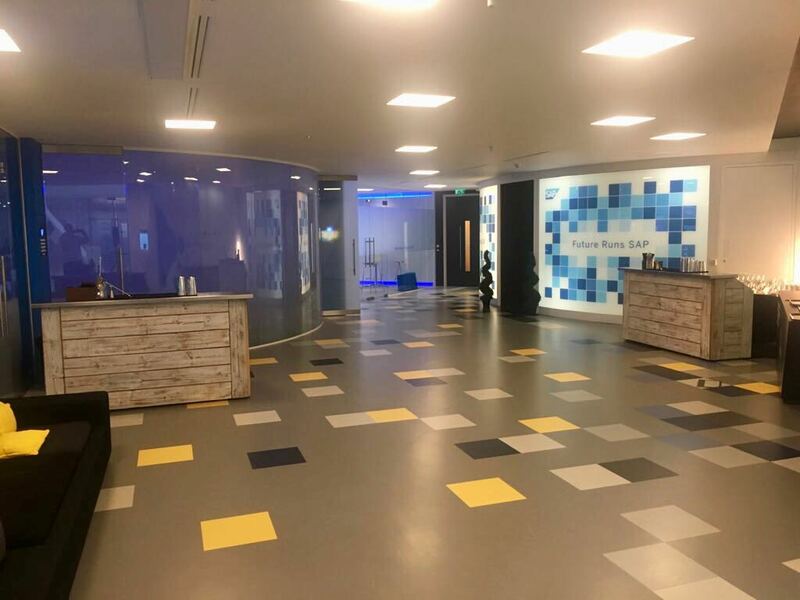 We were very happy to be asked back by SAP SE software solutions to their headquarters just outside Heathrow, at Feltham. 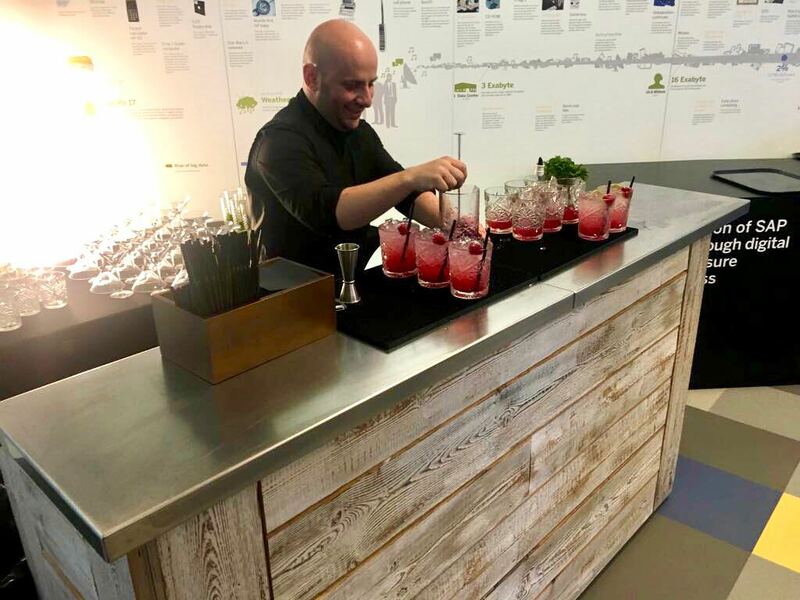 Two of our craft wood mobile bar hire were called into action this time around – from our Classic range – as opposed to a branded mobile bar, which we have put together for them in the past. Our Classic Range of mobile bars all feature original and therefore tactile fascias, adding that extra dimension of quality to your mobile bar hire. Our LED range of mobile bars, on the other hand are able to be back lit in a huge range of colour – as well as featuring almost any image or branding of your choice. So when it comes to choosing between the Classic and the LED range, each has its own advantages. Although it was a branded mobile bar from the LED range last time around, this time it was the turn of our craft wood mobile bar – a very popular mobile bar amongst corporate clients, having also featured for Aston Martin. 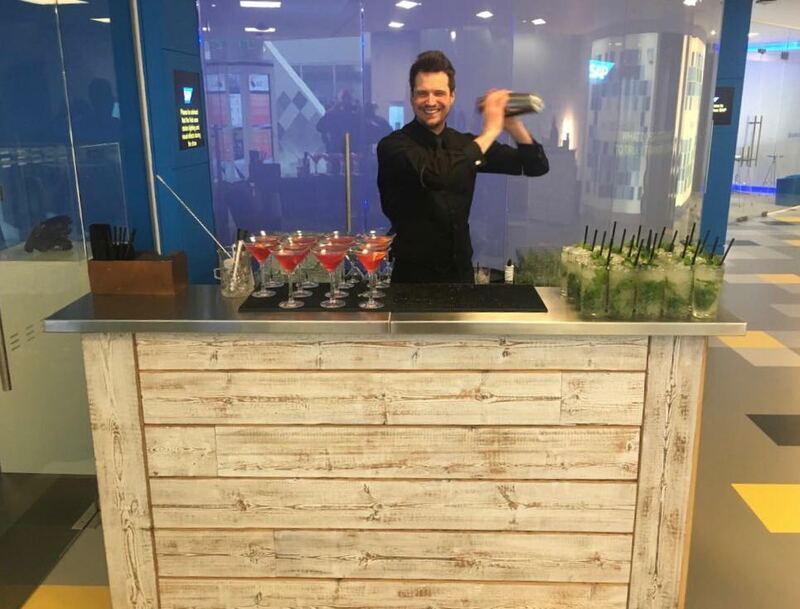 As you will find if you have a play around with our mobile bar creation tool, our mobile bars come in a range of lengths; starting at 2 metres and going up to almost any length you require. SAP required two 2 meter bars to be split across the space ensuring that the guests had more than one port of call for cocktails and further drinks, therefore our craft wood bar was split into two. In addition to our craft wood mobile bar hire, we also provided three of our professional mixologists, all the glassware and stock, as well as a host of cocktails from the Classic menu. As you can imagine the Classic menu contains all the party favourites when it comes to cocktails, with a few of our own variations thrown in for good measure. SAP opted for three cocktails to be served on the night, a mojito, a cosmopolitan and a raspberrylicious – all of which went down a treat. The event was the SAP spring party. Held every year at the SAP UK headquarters in Feltham, this event is always a great social for many of the software companies staff – with 200 happy employees in attendance this time around. We had a great time entertaining the SAP staff and look forward to working with the whole team again. If you are interested in our craft wood mobile bar, craft wood bar, mixologist hire, or anything else – then please do not hesitate to drop us a line. To have a go at designing your own mobile bar for an upcoming event, why not try out the Ace Bar Configurator?